Wet scrubbers are used to clean air, fuel gas, and other pollutant gases and particulates. In wet scrubbers, water and various reagents are used to remove the hazardous gases or particulates from the airstream. Dry scrubbers, also classified as dry sorbent injectors (DSIs) or spray dryer absorbers (SDAs), remove acidic gases from the airstreams created by combustion processes. A variety of alkaline materials and slurries are used in the dry scrubbing process. 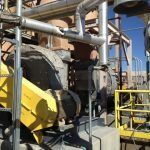 The industrial fans used to process the air in scrubbers need to be highly efficient, corrosion-resistant, and adaptable. AirPro builds high-efficiency, corrosion-resistant industrial fans & blowers with available special alloys and coatings.